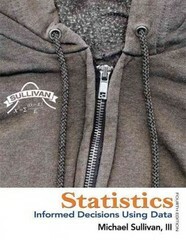 Statistics 4 Edition Michael Sullivan’s Statistics: Informed Decisions Using Data, Fourth Edition, connects statistical concepts to students’ lives, helping them to think critically, become informed consumers, and make better decisions. Throughout the book, “Putting It Together” features help students visualize the relationships among various statistical concepts. This feature extends to the exercises, providing a consistent vision of the bigger picture of statistics. This book follows the Guidelines for Assessment and Instruction in Statistics Education (GAISE), as recommended by the American Statistical Association, and emphasizes statistical literacy, use of real data and technology, conceptual understanding, and active learning.